MUMBAI: Colors’ controversial reality show Bigg Boss has completed its fourth edition with a viewer response that may propel the channel to soon come out with yet another fresh season. 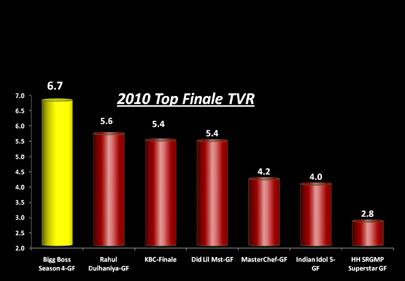 As per Tam data, the grand finale of the show on 8 January not only fetched a whopping 6.7 TVR for over three hours of telecast time but also surpassed the ratings of all recent reality shows like Rahul Dulhaniya Le Jayega (Imagine TV), KBC (Sony), DID –Li’l Masters (Zee TV) and MasterChef (Star Plus). Colors has aired three seasons of Bigg Boss, and with every season it has seen a jump in the ratings, be it opening, weekday or weekend. Tam data states that the recently concluded season with Salman Khan as host scored a TVR of 4.8 TVR. This is higher than season two‘s opening TVR of 2.5 (this is first season on Colors, hosted by Shilpa Shetty) and season three‘s (with Amitabh Bachchan as a host) TVR of 4.6. In fact, the finale of the three seasons has also seen a gradual progress - from 2.8 TVR (season two) to 3.6 TVR (season three) and finally 6.7 TVR. 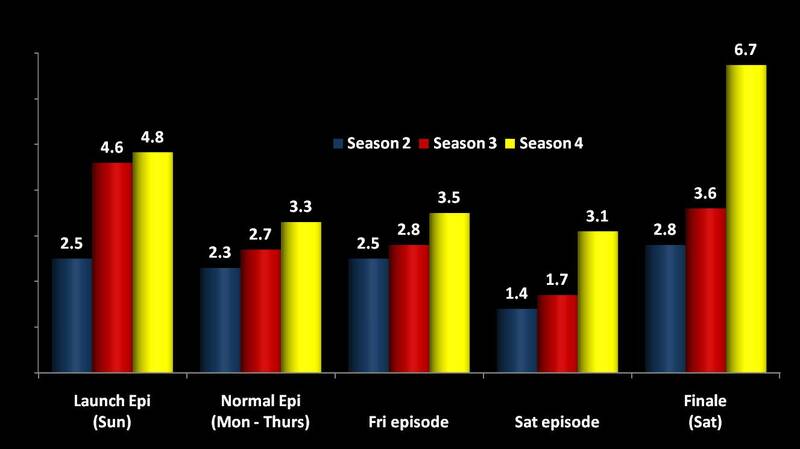 “Season 4 has been received well by the audience right from its first episode. We are humbled by the viewers amazing response. This is indeed a very big motivation for us to push the envelope further and gear up for the next season with yet another set of interesting elements,” Yardi added. As per Tam data for different demographics, Bigg Boss finale attracted higher SEC (AB) as the segment clocked 8.1 TVR, while lower SEC (C/D/E) notched up 5.6 TVR. While among female audiences the rating stood at 7.8, the show got a TVR of 5.9 from male audiences.